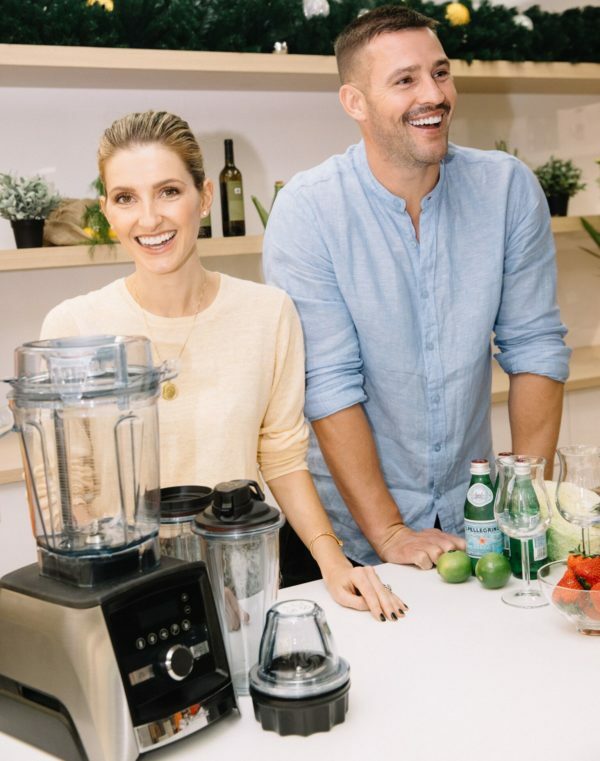 A model and former professional athlete Kris Smith is these days busy juggling his longtime ambassadorship with Myer, working with Vitamix and the imminent arrival of a baby with girlfriend, personal trainer Sarah Boulazeris. 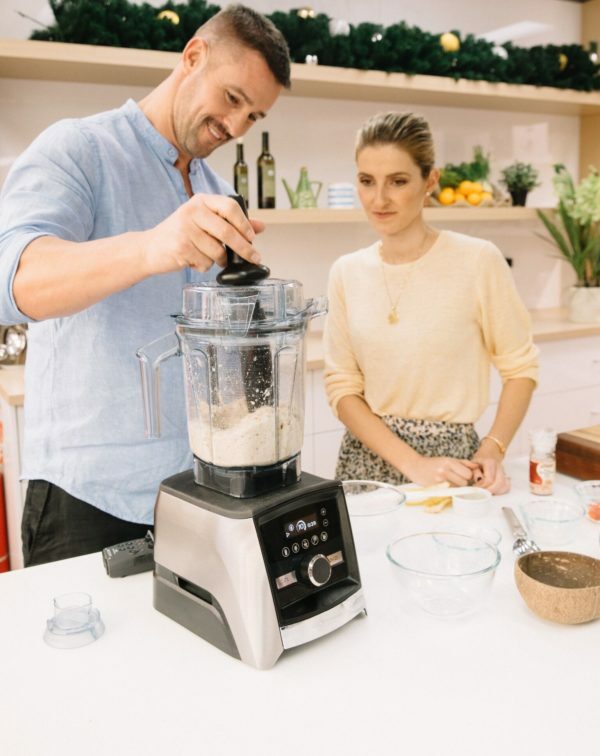 I recently caught up with Kris in the kitchen as he whipped up a meal for me whilst we chatted about becoming a dad for the second time, the unconventional way he and Sarah got together and why he’s about to embark on a new career in the fitness industry. Kris, what is a day in the life of you at the moment? At the moment it’s all preparation for baby coming…I generally wake up, take the dog out for a big, long walk, hit the gym, and then I’m doing my personal training course. Yeah, I’m definitely a good dad, but I turned around to [Kris’ partner] Sarah, and I said, “How often do they feed? Is it every two hours?” and what do you do? And I understand that there’s three cries, like the hungry, the nappy changes, or the tired, and you quickly learn those three. Then I’m going, “How often do they eat?” and “How often do they do this?” and “How often do they do that?” And they’re so small and frail and dainty, and when can I take them to the pub? And that one didn’t go down too well, but no, it’s a real exciting time, and Sarah’s been absolutely incredible. Is Ethan [Kris’ son with ex-partner Dannii Minogue] excited? Very, very. I said to him, “Okay, would you like a brother or a sister?” He said, “Well, I’d like a brother. Oh, but I’d love a sister, too,” so he’s got that perfect answer. It’s like he’s been told what to say, but he generally feels that way, so he’s very excited. Is that a bit daunting to be new dad again? Well, I don’t like sleep anyway, and that’s the thing. I bumped into some friends this morning, and they’ve got their baby there. The baby was 24 weeks old. Said, “How’s it going?” They said, “He sleeps right through,” and Ethan did the same thing, but you’ve got to be really careful who you say that to because parents hate it. So I’m thinking if the first one slept right the way through, this one has to have all the attributes of the complete opposite because my mum told me that I never slept until I was five. My mum would be in bed, she’d feel a slap on the face, and it would be me, and I would say, “Come on, let’s play. Let’s play,” until I was five years old, so I’m hoping that isn’t replicated in our house. What does being a Myer ambassador mean to you? It means everything. I came to Australia on a six-week holiday with Danni just seeing if I like the place, and I never left, and within the first four weeks of me being here, Myer wanted to meet with me, and then they met with me, and then they liked me, so they offered me a six-month contract after four weeks of being in Australia. They offered me six months, and I was over the moon because I’d never done anything like this. I’ve been there nine and a half years now. It’s the longest job I’ve ever had. I love being around people, so any event, dinner, charity organisation, race day, that they have that I can meet new people and my job is to make sure people are having a good time, which is what I want to do throughout my whole life, so it seems like a perfect fit, and I like everything it’s done. And I’ve met some incredible people doing it. You and Sarah are very focussed on fitness. Is healthy lifestyle important to you guys? Definitely. It’s great that she’s so engulfed in health and fitness, and she does all the cooking at home pretty much. Yeah, she’s that incredible. She’ll wake up at 4:45am. She’ll make breakfast for herself, and then she’ll make breakfast for me for when I wake up. Can she move in with me please? So is your Vitamix an important part of your kitchen? It is. We never had one before or never had anything that resembles a Vitamix because I’ve lived by myself for so long, and once we got one in, I’m kicking myself, saying, “Why did I not know about this 10 years ago?” Now I got all the fruit that goes in there, the smoothies, the vegetables that come out great. 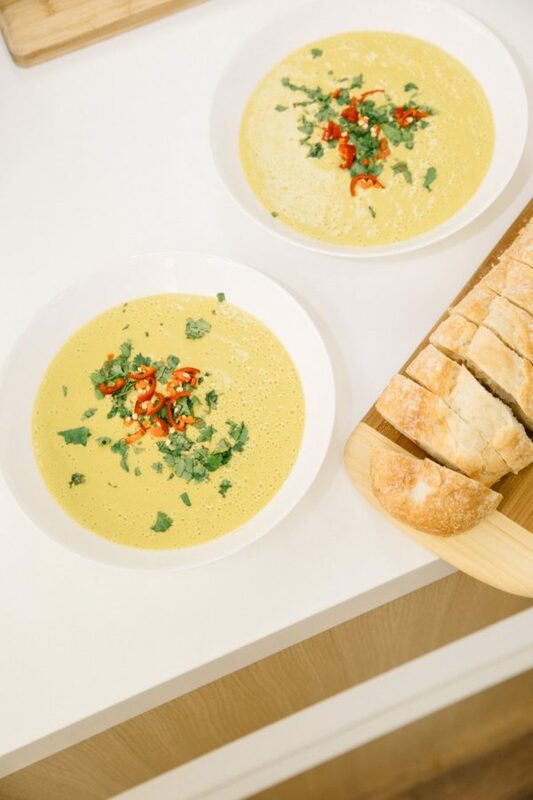 We throw pumpkin in there and make pumpkin soup and just about everything literally goes in there. Protein shakes after the gym. It gets used pretty much once, if not twice a day, it’s at least every day. What’s the best aspect of it? I just think the ability that it has. It just simplifies absolutely everything because I do get dragged into the kitchen. Sarah doesn’t like touching chicken, so if I’ve got to shred the chicken, I’ll go chuck it in the Vitamix. 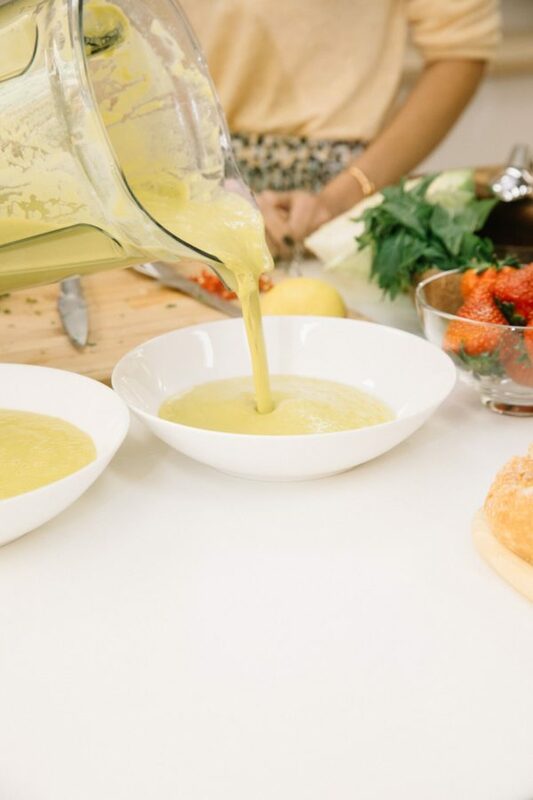 What’s your go-to recipe when you’re cooking? My go-to. See, my go-to recipe has always been, it was always chicken pasta, I believe. Yeah, like a carbonara one. Do you make that with the Vitamix? No, I’ve not made that for about 15 years. It used to be my-impress the girls signature dish. And it’s the only thing I could do other than beans on toast, and that’s not as impressive, but in the Vitamix, I’d reckon the pumpkin soup. Sarah taught me how to make pumpkin soup. So what I do now, I mush everything up in that, and it purees it. It saves me an incredible job of mashing it up and then draining it. And it does absolutely everything. And then what I do, I pan fry some light chicken breasts with a curry sauce, and then that goes in the pumpkin soup. We love spice. I would just chop that and let it sit on the top. What’s next for you? What’s on the horizon? Well, the thing is yeah, the baby’s going to engulf a lot of the time, but I’ve got some stuff that I want to do in and around fitness. I just want to get a couple of places open because when you’re waiting in between jobs in an environment, industry like this, it can be quite frustrating and you’ve got to have a lot of patience, which I don’t, so I think it’s time for me to finally invest my time and effort into some form of fitness, whether it be a gym or a female studio or an online application, wellness centres, and things like that. So what do you love most about Sarah? Everything. This is going to sound really awful, but I’ve never had a partner that I’ve laughed so much with every day. There’s always something stupid that one of us does that just sets you out in fits and giggles. And for me, I don’t take life too seriously anyways, so it’s an important fact for me. And we laugh a lot, and she’s caring, considerate, and she’s just wonderful, really. So any wedding bells any time soon? Maybe. Yeah, we have spoken about it. Would you believe, we’ve only been together a year? I know, I was trying to work that out because I remember when we were in Bali together last year you guys had just met. Yeah, we saw you in Bali, and that was pretty much our third date… She hates me telling this story, but it came through the opportunity to go to Bali and it was for two people and we did. And then when did you know that she was the one? It wasn’t long after that [Bali]. We came back and I thought, “The holiday romance potentially, that’s all gone. Let’s see what real life is.” And then I’d find myself, I’d go to bed at night, and then she’d be at her place, and I’d just go, “Why is she not here?” And without being needy and wanty, I’d just go to bed and think. I’d text her and go, “Well, why are you not here?” She goes, “I don’t know,” and then very quickly she moved into my place, and then very quickly after that fell pregnant, and now we have the dog, the big house, and the baby on the way. The nursery’s set up. What’s your number one fitness tip? Just keep going. Times when you don’t want to go is usually the time the best time you do a session. The biggest mistake for me is picking your phone up first. So you pick your phone up first, and then you scroll at the weather. Before you know it you’re on Instagram and Facebook, and there’s an hour of your life, wasted. And then you’re tired again. You just roll back over, so my first thing is, don’t think about it, just go. Absolutely. Yeah, because like I say, there are times when I don’t want to be there, and they’ve been the hardest sessions I’ve trained for. Well again, there’s hopefully a big announcement coming in which I’m going to start doing early next year. Potentially got some more TV filming, which I can never speak too much about them because they keep them under wraps, but I want to pursue the fitness. I want to ensure we get a happy, healthy baby into the world. And yeah, just knuckle down and just chase dreams that I want to do in and around fitness and all of that. How good. Congratulations again on the baby news. Place 1 whole peeled lime, lime juice, honey, ginger and 8-10 mint leaves in your blender container. For Vitamix Start on speed 1, turn machine on and slowly increase to SPEED 10 for a few seconds until smooth and creamy. In six individual glasses – place 1 wedge of peeled lime and 6 mint leaves. Muddle (gently press down with a wooden implement) to extract the juices just a little bit. Add 4 to 6 tablespoons of the blended mix to this and top with sparkling water and desired amount of ice cubes. You may want to garnish with more mint and ginger. 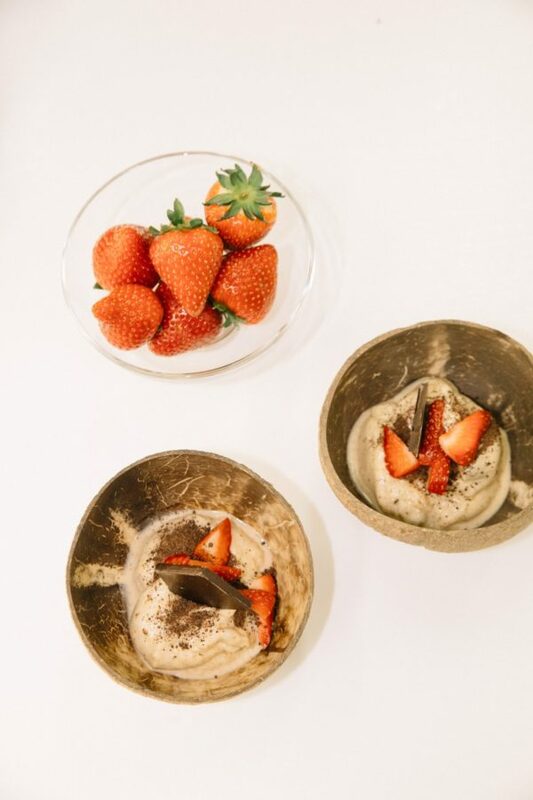 This recipe can be made in the NEW Vitamix Blending Cup, simply use 1/3 of ingredients. Blend for 5 minutes or until heavy steam escapes from the vented lid. Put all the ingredients into the Vitamix 2L container in the order listed and secure the lid. Use the tamper to effectively press the ingredients into the blades whilst processing. Blend for 30-45 seconds or until desired consistency is reached. Stop the machine and serve. Serve with Lindt 70% dark chocolate grinded in bowl. Having lunch with Kris Smith. Television presenter, model and former professional athlete Kris Smith is originally from Manchester, England, but hung up the football boots to move to Australia in 2008 with then-partner Dannii Minogue. The power couple had a son, Ethan, in 2010 but split almost two years later. 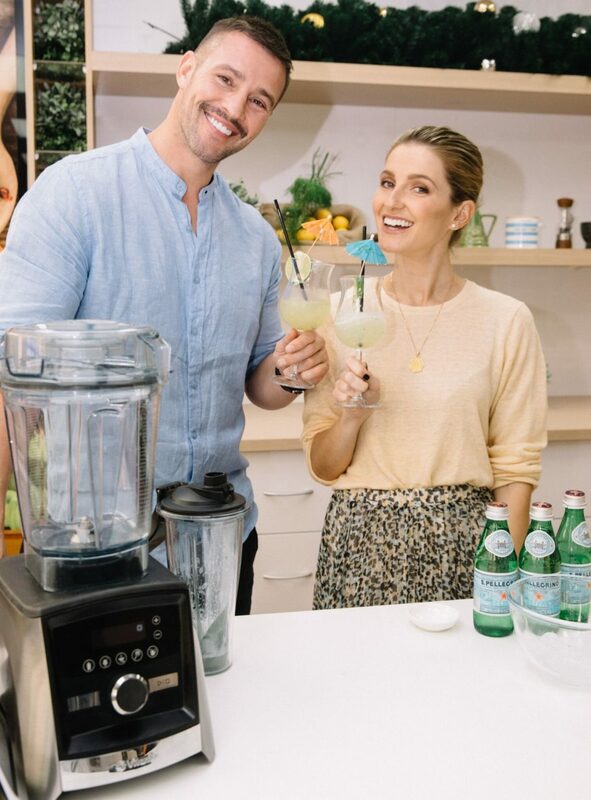 Smith is the co-host of Channel 7’s national afternoon program The Daily Edition and a Myer ambassador alongside Jennifer Hawkins. I caught up with Smith, 35, to chat about his career, fatherhood and those engagement rumours with girlfriend Maddy King. Rachel Griffiths, Frances Abbott, Bridget Abbott and Nicole Trunfio. 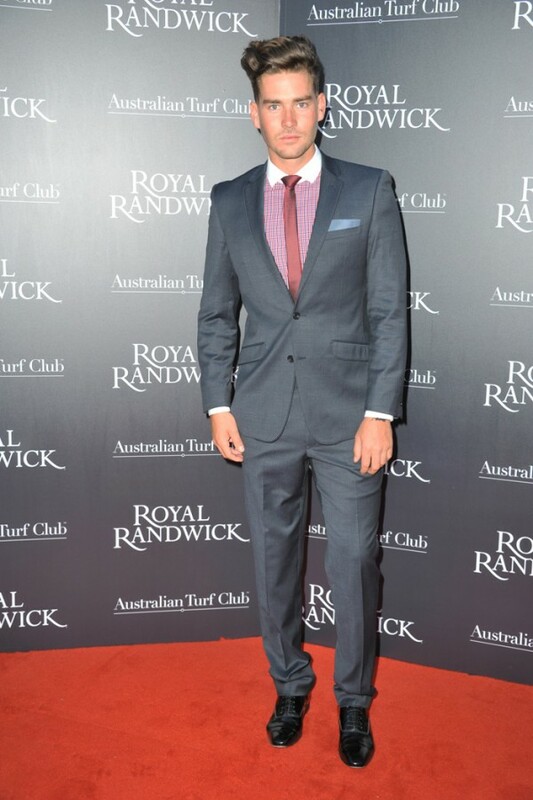 The Australian Turf Club (ATC) officially launched the new Royal Randwick grandstand with a gala spectacular last Thursday night. The event kick-started with an arena performance in the Theatre of the Horse followed by a sit down Royal feast for 550 guests. 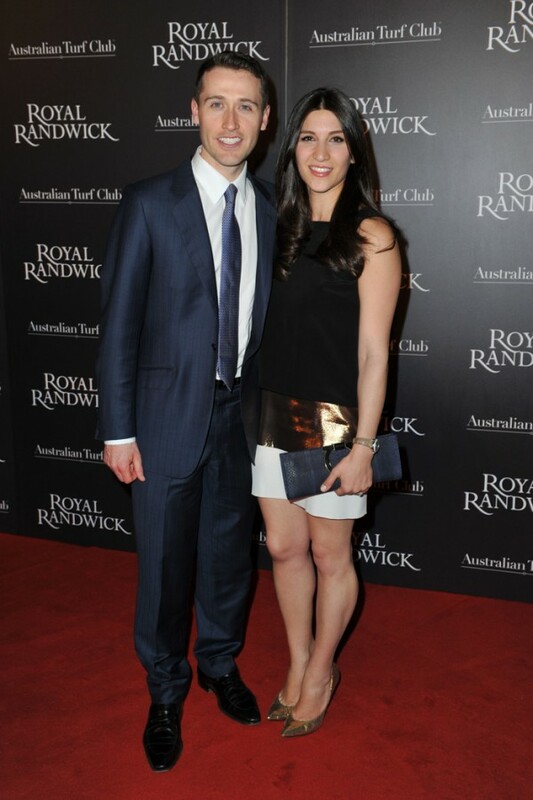 The end of dinner signaled the commencement of even more festivities in the Royal Randwick ballroom. The ballroom transformed into three distinct venues, transporting guests to a carnival of circus acts, a surreal parlour of performers and a whiskey bar with live music and DJs as invitees celebrated into the night, among the first to experience the stunning makeover. Jen Hawkins in Manning Cartell. Maddy King & Kris Smith. Jen Hawkins in Aurelio Costarella. Myer Ambassadors Jennifer Hawkins and Kris Smith hit the runway for the Myer Spring Summer 2014 Collections on Thursday night. 500 VIP guests view the spectacular parade that showcased 62 models and over 200 new season looks by Myer’s stable of leading Australian designers. Staged at the enormous Stage 7 at Fox Studios, the 48 metre long catwalk was flanked by 100 metres of low lying abstract ravines elegantly inlayed with 1 tonne of richly coloured dust and glitter creating a setscape as far as the eye could see. Jennifer Hawkins made a stunning entrance in Manning Cartell to open the show. Jennifer took to the catwalk five more times through the show wearing designs from YB J”AIME, Leona Edmiston, Aurelio Costarella, Cozi by Jennifer Hawkins and Maticevski to close the show.